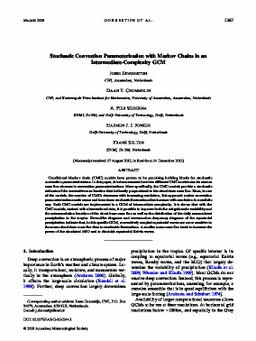 Conditional Markov chain (CMC) models have proven to be promising building blocks for stochastic convection parameterizations. In this paper, it is demonstrated how two different CMC models can be used as mass flux closures in convection parameterizations. More specifically, the CMC models provide a stochastic estimate of the convective area fraction that is directly proportional to the cloud-base mass flux. Since, in one of the models, the number of CMCs decreases with increasing resolution, this approach makes convection parameterizations scale aware and introduces stochastic fluctuations that increase with resolution in a realistic way. Both CMC models are implemented in a GCM of intermediate complexity. It is shown that with the CMC models, trained with observational data, it is possible to improve both the subgrid-scale variability and the autocorrelation function of the cloud-base mass flux as well as the distribution of the daily accumulated precipitation in the tropics. Hovmöller diagrams and wavenumber-frequency diagrams of the equatorial precipitation indicate that, in this specific GCM, convectively coupled equatorial waves are more sensitive to the mean cloud-base mass flux than to stochastic fluctuations. A smaller mean mass flux tends to increase the power of the simulated MJO and to diminish equatorial Kelvin waves.